Korres Lily Bouquet Hand Cream Trio - 2.54 fl. oz. 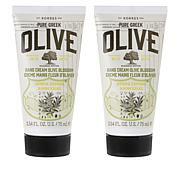 This moisturizing, non-oily and ultra concentrated hand cream with a light texture is ideal for everyday use. A mixture of violet, rose, jasmine and ylang ylang forms a fresh floral accord reminiscent of spring bouquets. Free of mineral oil, petrolatum/paraffin wax, silicones, parabens, propylene glycol, ethanolamines, SLES, ALES, synthetic dyes, phthalates, polycyclic musks, retinol and animal by-products. KORRES Lily Bouquet Ultra Moisture Hand & Nail Cream 2.54 fl. oz. PHENOXYETHANOL, SALICYLIC ACID, SORBIC ACID, SQUALENE, TETRASODIUM GLUTAMATE DIACETATE, TOCOPHEROL, TOCOPHERYL ACETATE. At first I was using the key butter on my hands but it left a greasy feeling. 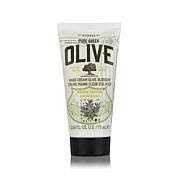 This hand cream is so great and just like the body butter you I ly need a little to keep your hands moisturized. I am extremely disappointed in the container (tube) cap, as it doesn't close securely or stay closed; that is to say, it DOES NOT close. All 3 tubes of this hand cream, in my order, are the same. I expected better quality!